This quilt has been a long time coming! I started collecting pieces of Liberty of London fabrics several years ago – just tiny pieces here and there, hoping that one day I’d have enough to make an entire quilt out of these gorgeous fabrics (and they are gorgeous, though definitely more expensive than your typical quilting cotton, which explains why it took me so long to collect enough for a quilt!). In addition to purchasing pieces of Liberty, several generous friends added extra variety to this quilt by sending along the most beautiful pieces so I’d have enough squares to bring this up to size. I wish I could name names, but I’m writing this late at night and I’m quite certain that I’d forget someone and then I’d feel awful. So hopefully these friends know who they are, and know how much I appreciate their generosity. As you can see, it makes a great quilt for hanging out on outside (or for showing off your dance moves, as the case may be! ), but in actuality, its permanent home is on our bed. You might remember that when I made up the quilt top, it ended up a nice queen size, though we had just switched to a king sized bed. I added a couple extra rows to bring it up to size, and though it was perfect pre-washing, it did shrink a bit. It still fits nicely on the bed, though if I’m being honest, I do wish it were a bit bigger. I backed this in Cotton Couture Orchid, and used the lowest loft batting by Quilter’s Dream. I love this batting, and have been using it quite often. I love the lowest loft for summer weight quilts, or for soft lightweight baby blanket/quilts. I think this will be a perfect quilt for the bed next summer (for now it’s layered over another quilt, and while I often wake up incredibly hot, I love seeing it on the bed, so there it shall remain! Anyway, thank you again to those friends who helped make this quilt possible! I absolutely love all the variety, and have already spent much time admiring individual squares and remembering where they came from. Thank you, thank you! I thought it would be fitting to pass along a bit of this Liberty love, so please leave a comment here and I’ll drop your name into the hat for a little bundle of special Liberty pieces that will hopefully either add to your collection, or help you start a collection of your own! I’ll select a winner on Sunday. Congratulations to Colleen (comment #218, as selected by random.org). Thank you all for reading, and for leaving such sweet comments about my quilt! This entry was posted in [search] Charm Quilts, Fabric, Posts about Quilts, Quilts and tagged handmade, king sized quilt, liberty of london, patchwork quilt, patchwork squares, quilt. Bookmark the permalink. 232 Responses to Liberty for the bed! What a gorgeous quilt. I love the colors of it. This turned out lovely! I have a huge stash of Liberty fabrics that I plan to finally do something with in early 2013. Thanks for sharing! So pretty – and you can tell that it’s just so soft too. I don’t have any liberty, but maybe someday! I’ve never had any of the Liberty fabrics. I remember going to Liberty of London and seeing the prices though! Now I wish I had indulged. It is gorgeous! I love liberty fabric, but as you said it is a bit expensive. What a great idea to start a collection and add to it over time. I’d like to put my name in the hat! I love the look of this and plan to make one for myself. I have a small start of a selection of Liberty fabrics – it would be great to be able to add to it! Such a beautiful quilt! Congrats on completing such a long project! That’s a lovely quilt! I used some of the Liberty pansies in a quilt recently and have bought some squares to put in another quilt I’m planning! I have been admiring Liberty of London fabrics for ages and would love to start my collection with your give away! What an awesome collection! I’ve never really been into the Liberty fabrics, but seeing them all together has inspired me to start a Liberty stash of my own and maybe put together a quilt like this. Gorgeous! your quilt is ah-gorg-e-ous! kudos to you for collecting and saving liberty for so long. my only piece of liberty is (shockingly) a large remnant stamped ‘imperfect’ which I found at the thrift store– before I knew what liberty was. I’d love to win your bundle and start saving for a liberty quilt of my own some day! It’s beautiful. I’d love to do the same but so far, I just have 3 fat quarters of Liberty that were gifts from a generous blog reader! This is gorgeous! I love all the colors and the quilting is perfect. Congrats on a big accomplishment!! So lovely, I have just a couple small pieces of Liberty, all stored in its own little box. My goal would be a baby girl quilt, for my granddaughter, she hasn’t even been conceived yet, but it will take awhile to collect my Liberty. Beautiful! I’m always amazed at your persistence in quilting your own quilts. The dogwood pattern is just right! This is beautiful! It’s so satisfying to finish a quilt that has been a long time in the making. Your quilt is beautiful! Sometimes things are totally worth the wait, aren’t they? Thanks for the chance to win. It is a gorgeous quilt….I hope someday to make a quilt for our bed…but anything that big still scares me. Ah, ’tis a thing of Liberty-ed beauty! Oh my goodness! Thank you for sharing the Liberty. I am hoarding some of the new quilting cottons, but I would love to have some of these soft, happy scraps! Beautiful! I bet it looks great with those nosegay sheets your sister bought you. Lovely Liberty Quilt! I am inspired! Thank you for sharing your creative gifts with us. I love it! Liberty fabric is so pretty! Beautiful! I’ve been pining over Liberty forever but have yet to get any! Love the quilt with all the wonderful colors and Max in the middle of it all! I’ve been collecting Liberty scraps for a long time too ~ thanks for the inspiration! Great quilt. Thanks for sharing! It’s so beautiful I could cry (happy tears as my girls would say), you must be so proud well done! your quilt is gorgeous! i have one fat quarter of liberty, and i just keep petting it carefully. Lovely quilt. So far my Liberty collection is one remnant, but I try to always keep an eye out for more. Stunning quilt! I have an itty-bitty liberty collection too. The fabrics are all still too precious to cut up and turn into a quilt but some day I’ll find the right project. Thanks for the chance to enhance my stash! Love the quilt–it’s so soft and feminine! It turned out beautifully. Thanks for the giveaway. Enjoy the weekend. Beautiful! I can “feel” the softness. Would love to start my own collection! This is truly beautiful! I’m gearing up to make a quilt for our bed – probably after the holiday making frenzy has concluded – and have found your blog to be a true inspiration. Thank you! Love this quilt! Liberty is so soft, smooth, and yummy. I do hope to do the same one day. How gorgeous! I can imagine that’s a quilt that would keep you smiling for years to wake up under. Liberty’s the type of fabric that your favorite block in 5 years might be different from today, but it never gets old! I myself have a couple Liberty fabrics that are leftover from/in the queue for garment projects, snuck one into a quilt and wow, did it amp up the quilt! Oh, what a gorgeous quilt! It is perfect inspiration for beginning my own Liberty stash. I love these fabrics and the quilt is gorgeous! Beautiful quilt! I would love to sew with some Liberty fabrics! I have seen everyone coveting thier little Liberty stashes but have not had the opportunity to start one of my own yet. I would love to see them in person! They are so lovely in everyone’s pictures. Your quilt is fabulous and I totally understand why you are in love with it! Max is getting so big! My Lucy was born around the same time (4/11/11) so I have so much fun seeing your baby pose on quilts. Not babies anymore, huh? You’ve made a lovely Liberty quilt. I may or may not be stockpiling Liberty Lifestyle fabrics and I’d love to have scraps to add to my collection. Good job getting this one quilted and finished! I don’t have any Liberty but would sure enjoy starting to collect some! Your quilt is beautiful! what a kind and generous, “pay it forward” giveaway. 🙂 i don’t have any liberty at this time, but i do covet it from afar. as much as i want to get my hands on some, if i won, the bundle might actually be a gift for a friend of mine. Your quilt is just beautiful Ashley! I can see why you would love seeing it on your bed! Max is just the cutest ever- and getting so big!! I would love to start a collection of liberty- what a great giveaway! Thanks! Your quilt is beautiful! I would love to have some Liberty fabric. Thanks for the chance. wow!! that is so gorgeous!!!! It’s lovely! I’ve always wanted to make a Liberty quilt, maybe this will be my kick in the behind! Cute little man to model the quilt. absolutely gorgeous! how wonderful it must be to have a quilt of liberty goodness on your bed! I have just started collecting Liberty. I think I have about 75 different ones, now. I’d love to add to my collection, so I can get on to deciding what I plan to do with them! I’ve not used Cotton Couture, curious if you are happy with it. And I did just discover the Quilters Dream battings and am in love!! And do do find trying to figure out the perfect size extremely challenging! Every quilting pattern, fabric and batting makes such a difference in shrinkage! It’s beautiful! But your model is really cute. I keep dreaming of making a king size quilt for our bed, but I’m afraid of the shrinkage issue. Did you note what the dimensions of this quilt were before and after washing? Just curious. Wow this is amazing. I love the Liberty!! What I love about Liberty is how classic it is! You’ll always love this quilt, but I think you’ll find others still like it 40 years down the road – it just has that appeal! I’d love to throw my hat in the ring to start a Liberty collection. Your quilt looks spectacular. What a goregeous quilt! Everything about it is just beautiful. Congrats on finishing it and thanks for the giveaway! Gorgeous quilt Ashley. I have Liberty fantasies of my own. I always preshrink my fabrics so I do get that wrinkly look that I love from the batting shrinking but I don’t think I lose too much overall size – though mind you, I had never measured ‘before’ and ‘after’. I love the quilting! I’m wanting to make a simple patchwork quilt to try it out! Beautiful quilt! I don’t have any Liberty in my stash yet, would love some! I already have a small stash of Liberty building up, an addition would be amazing! that is my dream quilt! i adore liberty and i love that you used a simple patchwork to really show off the fabric. I would be absolutely tickled to win a little Liberty! Your quilt is just AMAZING! It’s hard to use up those bits of fabric you love, until you find the perfect project for them! You did it! What a gorgeous quilt! Maybe someday I’ll be able to make my own Liberty scrap quilt, if only I’d start saving.. I am dying to master that dogwood pattern. It is just too perfect for simple patchwork! whoa! thank you for a chance Ashley, I would love to add to my little shoebox collection of LIberty to one day have a quilt for my own bed! I have a little collection of m own started…I adore your quilt…very inspiring! Gorgeous! I’d love to start stockpiling Liberty fabrics so I can have a quilt like this some day. I almost reached out to the computer screen to give this wonderful quilt a gentle pat. I know it must feel as lovely as it looks; Liberty is just delightful! Your quilt is absolutely beautiful. I love how all the busy Liberty prints work together is such a lovely way. I always look forward to your latest–always an inspiration. I’ve started a tiny Liberty stash of my own on a recent trip to London, so I’d love to add to it. Thanks for providing all this inspiration! Beautiful quilt! I love Liberty fabric. Thanks for the chance to win! I love your Liberty quilt, it inspired me to start my own little stash. It’s small right now, but I add a little each month, so one day I’ll be able to make my own. I think your choice of the dogwood quilting is perfect! Gorgeous! Very impressed with the quilting pattern and the fact that you quilted a king size on your machine. Oooo, I would cherish a wee bundle of your leftovers!! This quilt looks dreamy and I think the dogwood was a perfect quilting choice to keep things lofty and soft. I love how much you are enjoying it! I’m so jealous you got a king sized quilt quilted on your home machine – and using the dogwood pattern no less! We are about to upsize to a king and I’m dreading making the quilt for it. Thanks for the inspiration and shot of confidence. Just be sure to start the quilting from the middle and move out. Seems to work much better, and by the time you are tired of the machine, it is easier to work. It is absolutely gorgeous! I hope you will eventually indulge us with a photo of it on the bed so we can get the whole effect. I totally understand that ‘messier’ stage of cleaning. Thanks for a chance to start my own Liberty collection! Gorgeous!!!! Would love to start this collection! What a dreamy quilt! I love the way the colors have all melted together..it is a beautiful picture. When I was in college, I made a full skirt out of Liberty fabric…how I wish I had it now to cut into little pieces! Even 35 years later, they still use the same fabric. Timeless, as is your quilt! Great quilt. I love the random feel. I just ordered my first little stack of Liberty and want to collect a bunch to make a quilt like yours. Hopefully, a trip to the London store next year will help. 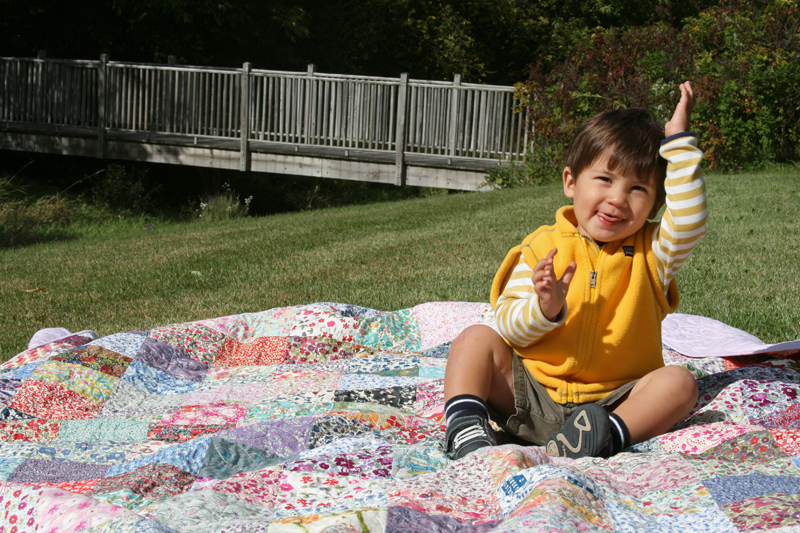 Your quilt is lovely and your little guy is growing up too fast! This is fantastic…….I have just found the Liberty Love and started collecting. It’s a bit like having swap cards in the playground….got that one…swap you for this one…. Love your quilt. It has a certain warmness to from the understated liberty prints, that from a distance are soft and when getting close theyre really complex. Reading this i just realised I may have started collecting Liberty too. When at my local quilt shop a few months back a saw this small bundle of greens and slightly pinks. The fabric was thin and oh so soft… And I bought the bundle. Then last week when I was there again I saw some blues… And bought them too. I guess I’m in deep trouble now… And only have myself to blame. Stunning 🙂 I hated, with real passion, Liberty fabrics, until – bizarrely, my 31st birthday a couple of months ago. I don’t know if it was age, the stress I was going through at the time, but I found myself sitting down that day and ordering some Liberty. I’m collecting “scrap packs” and small pieces and hope to make a Liberty quilt to celebrate my 32nd and the ned of a stressful year! Beautiful quilt! Very inspiring, now I want one of my own. The quilting looks great as well. I love this quilt. It reminds me of one my grandmother made (and inspired me to start quilting). Thanks for sharing! It’s gorgeous. I’m in the midst of making a basic patchwork square quilt. Yours is amazing! The quilt is lovely and Max is so cute and growing fast. I’d love to start a collection of Liberty. Thanks for sharing. I’ve started a Liberty collection. It’s quite small (I only have one fabric right now), but I hope to add more soon. Lovely quilt! Beautiful! I should be receiving my first swap bundle of liberty in the mail soon! 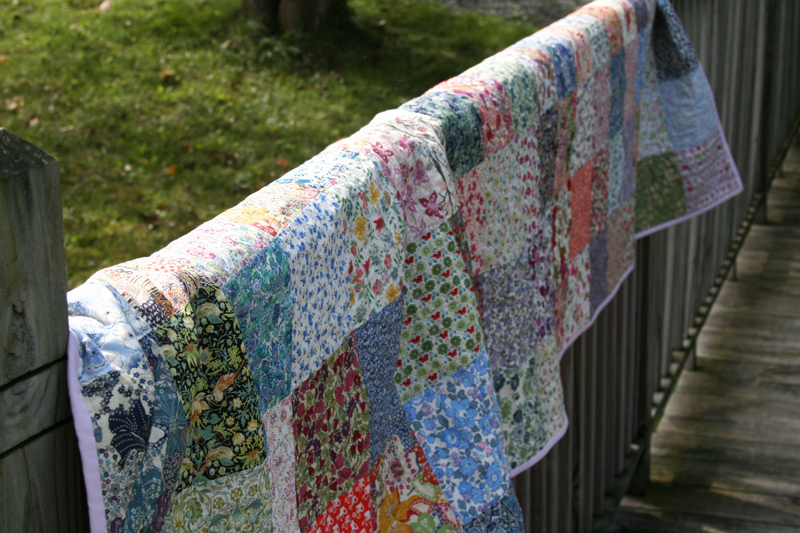 I am collecting Liberty pieces for a quilt too! Thank-you for sharing, hopefully I will be able to do so too, someday. What a beautiful quilt. Those Liberty fabrics are gorgeous! I don’t have any Liberty fabrics yet, but I would sure love some! Your quilt is beautiful. How truly generous to share some Liberty fabric. Your quilt is gorgeous, and I would like to collect Liberties too. Love that quilt! A while back Target sold some bikes in a Liberty of London fabric pattern. I heard they sold out in a matter of hours. I saw one of the bikes on display (not for sale) and could totally see why–had I happened to Target and seen one of those bikes, I’m sure I would have splurged! Lovely! I don’t have any liberty so I’d love to win some to start. 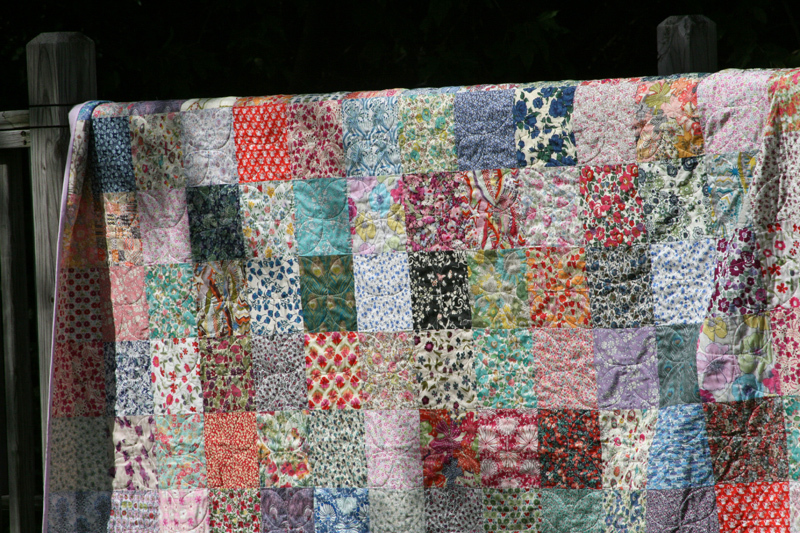 I love simple patchwork quilts but one made with liberty fabric? Swoon! I have a few bits of liberty! I’d love a few more to finally bake a quilt! I think it was on Purl Bee that someone made a wholecloth baby quilt with Liberty and it was so darling because the fabric is so pretty on its own! Your bed quilt is beautiful and probably so soothing in a bedroom, with the cool, calm colors (with a few pops of fun thrown in!). I’ve yet to make anything bigger than a baby quilt, but when I do finally make a quilt for our bed, I’m sure it will live there for a VERY long time — regardless of the weather! 🙂 Another wonderful quilt you’ve made! That’s so pretty! I bought some Liberty as part of my first big fabric purchase (husband gave me a very generous gift card at a pricey NY fabric store shorty after I became addicted to quilting!) but didn’t really know what I was getting! It’s gorgeous fabric and it will be ages before I have enough to make a quilt. Thank you for sharing. You’re so inspirational! Liberty scraps? Yes please! Beautiful quilting. That quilt looks so lovely and soft! Lovely! I’d love to experience some liberty in person! I have yet to start my Liberty collection as it will probably become a slippery slope 🙂 But if I was lucky enough to win….. Stunning. This is just beautiful and I love that you left it so simple and let the focus be on the fabric patterns. I officially have quilt envy. Someone gifted me some Liberty recently – I was unsure about what to do with them – but your quilt has inspired me to start a collection. Love Liberty! I have never worked with it or bought any but I have definitely admired from afar! Your quilt is gorgeous! I’m trying to do the same thing and make a King sized HST Liberty quilt with only one piece of each but it’s hard to build up a collection that big! Love those Liberty prints!! I have a few that I have been itching to get at myself….would be happy to infuse some of your scraps into my Liberty statsh!! I have long been curious about English paper piecing a hexagonal quilt, and I was fortunate enough to scam 15 minutes in Liberty store in August, where I picked up a starter pack of Liberty pre-cut hexagons. So begins my odyssey to locate more Liberty fabrics. Thanks for sharing your quilt, and adding to the motivation. Ashley, I’d never get tired of this quilt, love the sweet Liberty florals. Such a gorgeous quilt! I have serious Liberty-envy. 😉 I’ve friends over in jolly old England and am hoping they might send me a piece or two before long. It is a lovely quilt! I can imagine it took some time to collect the pieces. They are pretty expensive but oh so yummy. Wow your quilt is gorgeous! I think the dogwood pattern is perfect for those special squares. I will have to try it soon! Lovely quilt. I’m totally in love with Liberty fabrics after making a cushion cover for my aunt. In fact, I’ve already started making one for myself. Beautiful. Simply beautiful. Love liberty. Delicate and stunning at the same time. Stunning and delicate at the same time. What a sweet finish!! I have been thinking of collecting Liberty here and there–it’d be nice for applique and I’d love to end up with a pieced quilt eventually. 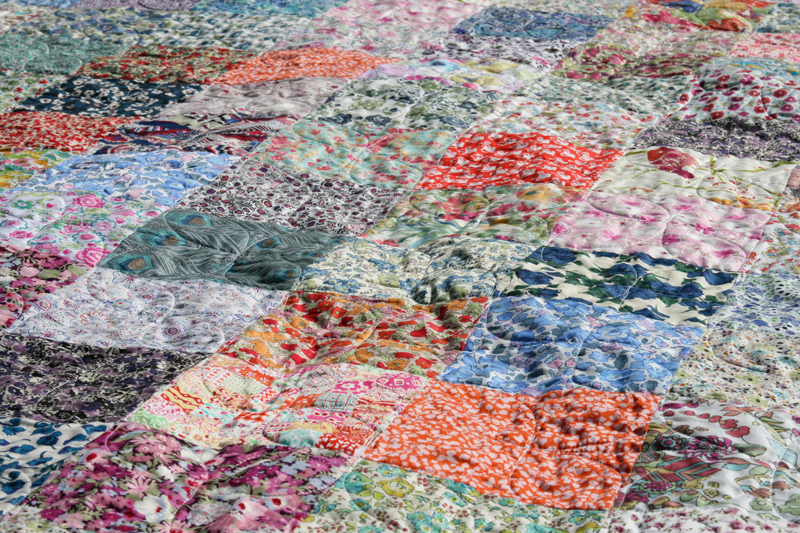 I love that you USE your quilts-especially those that are precious and meaningful to you. I have never been lucky enough to own any Liberty fabric so winning would be fantastic, particularly as we prepare for Sandy! Thanks! Love, Love, Love how this turned out! Your tiny dancer is adorable too! I love what you’ve done with this quilt. Perfectly snugly. I included a link to my blog where I’m working on a liberty and linen square. Loving it but would love more liberty. Thanks for the chance to win and for sharing! Love the liberty quilt but I only have a few pieces. I would love to add to my stash! I think your quilt is wonderful, thanks for sharing. What a beautiful quilt, I love all of the different colors and patterns. I would love a chance to play with some liberty prints. What a beautiful quilt and … model. Would love some of that fabric but just to be a grandma instead of mother to model. Your quilt is lovely! When I was a Sr. in high school (many many moons ago) I shopped at a Liberty store in London. I remember touching and wandering trying to decide what ONE piece I could buy. I would love to start a collection! Oh, I just love it! It’s my dream to make a Liberty quilt! Your quilt looks lovely. I would have so much fun sitting under it and picking favorite prints. I would love to win the little scrap bundle and be on the way to making my own. The quilt has a beautiful soft look. I don’t have any Liberty of London fabrics. That’s definitely something I will have to remedy in the future. 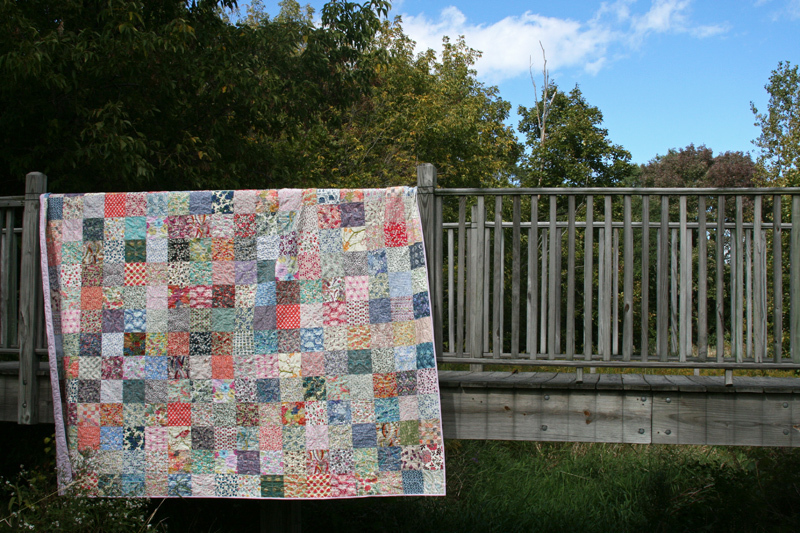 The low loft Quilter’s Dream gives the quilt a lovely drapey look. I’ll have to try it. Beautiful quilt and your son is adorable! I love all things Liberty and your quilt has so many of them! Just beautiful. Lovely! You have inspired me to make a liberty quilt and I have begun my collection of charm packs. Thank you! My dream quilt! Oh, it’s so beautiful. A starter stash of Liberty would be so fun and so dangerous. Thanks for the giveaway! Turned out so pretty. It reminds me of my very first quilt, full size though, and not Liberty fabrics. I am impressed that you quilted this yourself! Such a feminine quilt. Soft and cuddly. What a beautiful quilt! I am slowly collecting my own Liberty stash, but I think it will take a while to get large enough for even a baby quilt! Beautiful!! I love simple patchwork, it’s just timeless. It is lovely! I am sure it is wonderful on your bed. As much as it would be nice to win some Liberty, I actually wanted to just comment on this beautiful quilt. It is something you can treasure forever; time and generousity of friends all went into it. I have never had the opportunity to see or feel Liberty fabrics, but have always drooled when I see them online! Lovely quilt you made! This is such a beautiful quilt! The fabrics are really beautiful and the simple patchwork shows them off beautifully! Beautiful! I love the dogwood pattern you used. Perfect for all the floral prints. Just visited Purl Soho vacationing in New York – I love liberty! Beautiful quilt….it will have many years of love and is fitting since it was made with the love of wonderful sharing friends! I love knowing you quilted this entirely on your home machine! You inspire me! I would love to win some of this beautiful fabric, thank you! I love how all the pieces end up working so well together! Lovely mix of fabrics in your quilt. I’d love to experience first hand how wonderful Liberty is! I love your quilt! And i’d love to win! Your quilt is really pretty. I love how all the different patterns and colors go together. You did a lovely job. Love the simplicity of the quilt, and I think I’m going to have to try the dogwood pattern also. Your quilt is lovely!! You COULD take these liberty leftovers and make the quilt bigger for your king-sized bed. Consider it. Most of the work would be removing the binding. Adding size after that is no big deal. That is so pretty! I love those fabrics. I am going to have to check out that quilt batting because I really want to make a summer weight quilt for our bed. What a beautiful quilt. I’d love to have enough to make a wall hanging or mini quilt. I would love a lil bit of liberty of my own! Your quilt is beautiful!!! I don’t have any Liberty fabric. I would love to start collecting it though. Your quilt is lovely. I bought my first yard of Liberty at Nido! We went to VT for the fall colors and had to stop in. gorgeous! i’ve never seen any Liberty in person – guess i’m looking in the wrong stores! Im in the process of collecting my charms, but it might take me ages to get a king sized quilt together! Enjoy your beautiful new quilt! I just posted, but realized that my email address was incorrect. I have dreams of making my own liberty quilt someday. Yours is beautiful! I have no liberty…yet. I’m new to quilting so my stash is pretty small. Your quilts are such an inspiration! I live your timeless, classic Liberty quilt. I have loved liberty prints for many years and your quilt is gorgeous. So lovely! I love your quilt and am so happy you made it bigger and can have it on your bed. Oh, how I just love your quilt! I’m so jealous…I would love to start my own collection and make a quilt just like yours. I know I’m such a copy cat. Your quilt turned out beautifully! I’d love some more scraps to add to my tiny Liberty collection; still trying to decide what I should make with them! I’d love to start a Liberty scrap bag! What a beautiful quilt! There really is something wonderful about simple patchwork. What fun to look and look and touch and touch that beuatiful quilt! I like patchwork squares quilts. The price for the fabric makes me think I don’t want to purchase it ‘though. I have just starting collecting Liberty fabric too! I think it might be a long time before I have enough for a whole quilt as lovely as this though. I love the variety of the prints yet how they work together so well and I think the simple patchwork squares really showcase the beauty of the fabric. I love, love, love Liberty and only have one piece that I covet, and a couple Target home dec pieces from back when they were available for 2 seconds. I’m so jealous of this quilt, it’s beautiful! I started collecting when I saw your beautiful quilts. A few more will help. Thanks. beautiful! it almost looks of it’s an antique. it will certainly be cherished many, many years from now! Love your Liberty quilt and the soft colors. Would love to win some liberty scraps. thanks for the giveaway! I started collecting Liberty fabric a few months with the hope of someday making a quilt as lovely as yours. I’d love to win some scraps to add to my collection! This is beautiful. I know you’re excited to have it done. So nice of you to give away some scraps — I’ll put my name in the hat for them!! My dream quilt! Love love LOVE liberty! Oh, I love Liberty fabric. I made myself a blouse about 30 years ago with fabric from a specialty shop. They are impossible to find in Canada and I can’t really afford them anyway! But I would love to start a collection!! !